Terrafirma Wind Deflectors are useful in a number of ways: They enable the windows to be slightly open allowing fresh air to circulate even when it is raining outside without the water coming in, also they provide ventilation and help to draw out smells from food, pets and smoke when on the move. For vehicles fitted with tinted windows they reduce glare when the windows are partially open and significantly reduce wind noise while driving with the windows down. 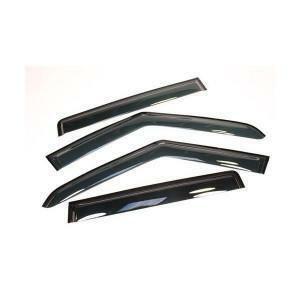 Terrafirma Wind Deflectors are smoke tinted and easy to fit, in most cases no tools or additional adhesive is required. For all models they are supplied with self-adhesive strips pre fitted for easy application to the door frame.